This feature allows recording of inbound and outbound calls. Extensions can be put into groups which makes it easier to keep track of calls. There can be jobs that only record inbound calls, outbound calls, or both. 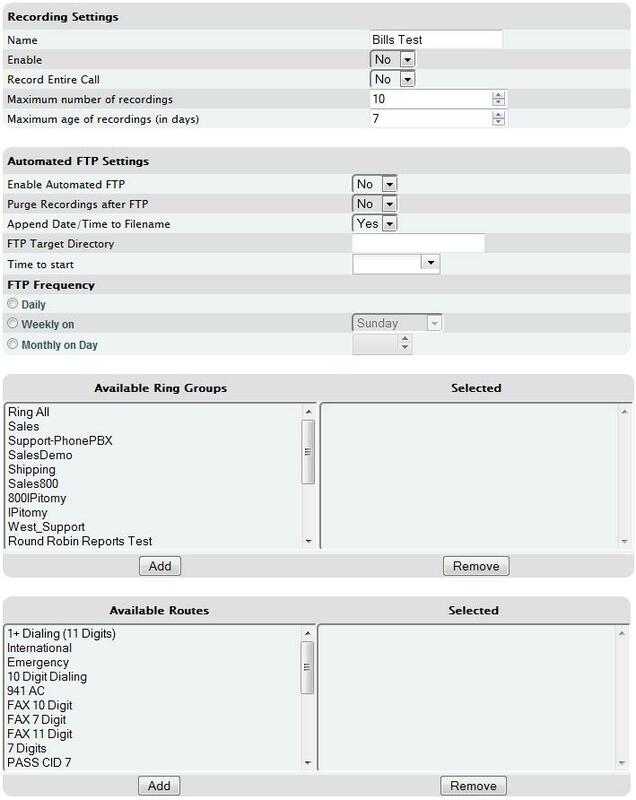 There are currently 3 main mechanisms for recording calls on an IPitomy IPPBX System. Initiated by agent, or Extension User while on call by dialing *# or pressing a programmed key on the phone. These recordings are either in Agent Recordings (if they are recordings by an agent taking a queue call). Or they are available in the work folder in the recording extension's mailbox. IPitomy has implemented integration with Trivium to support their call recording application. Licensed IPitomy Feature that records all calls on designated destinations. NOTE: When using the IPitomy Call Recording feature, it is advised to configure an FTP to push those recordings to so they can be keep for a long time, and to set the recording job to purge after an FTP push so that the file size does not get too large. Navigate to the Call Recording Page under the Applications tab. Enter the name of the recording group. Add Ring Groups to the recording job that are applicable to the group that you want to be recorded. Add Available Routes that you would like to be recorded. Maximum number of recordings Enter the maximum amount of calls you would like to have recorded. If the maximum number has been reached, then the old recordings will be deleted to make room for new ones. Maximum age of recordings Enter the maximum age of recordings. This will delete recordings after a certain period of time. This will clear out old recordings automatically to make room for new recordings. Available Routes Routes that can be selected to be included in the recording job. 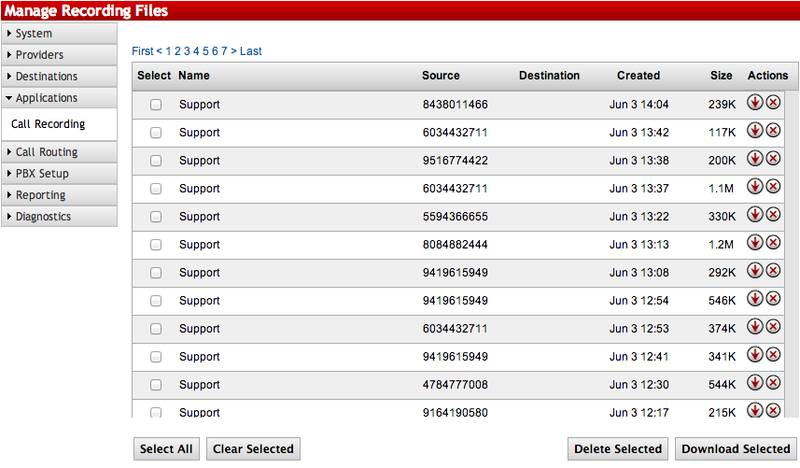 When one of these routes is dialed by any extensions on the system, the call will be recorded. Selected These are the routes that have been selected to be recorded when dialed by the selected ring groups. Click the icon to view the recording files for the group you wish to view. To download/listen to the recording files, click the button. After a day, the PBX will archive the recordings from the previous day. These are put into a .zip folder and can be viewed on the PBX or downloaded. If you download them, there will be an index.html file contained within the .zip that gives information about each recording (Recording Target, Filename, Size, Date, Source & Destination) so you can find the recording you are looking for. You can also then click the link and it will play the file you want.